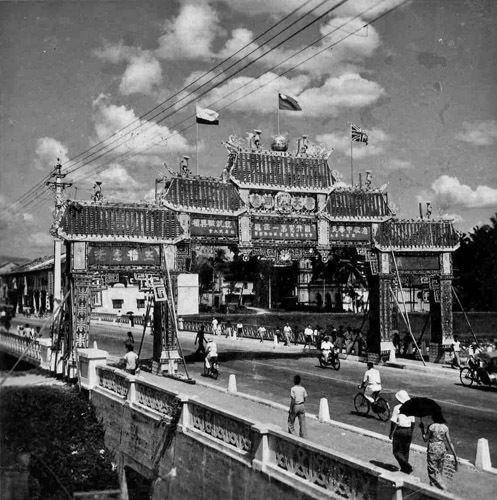 This arch was set up over the Hugh Low Bridge, in Ipoh, somewhere in 1947. This was before the grand parade – which was held in support of the Kuomintang Party (led by General Chiang Kai Shek). Notice the three flags at the top of the arch: the Perak Flag, the Kuomintang Flag and the Union Jack. To what we know, this parade was jointly sponsored by the Chinese Assembly Hall members and the Chinese Chamber of Commerce. How many of you out there remember this arch? Anyone witnessed the parade, or maybe took part in this parade? Can you name this street? Hi Ipohgal and LMS136. just to let you, and everyone else know: i think they’re building a permanent arch over the bridge; i noticed the pillars there a few weeks ago – but don’t know how far they’ve progressed…. Am also wondering about the design this ‘new’ arch would have…..
Hi Felicia, I think that these are going to be just 4 concrete towers. I cannot understand why they are needed as AGAION the detract from the heritage conservation aspects that the State Government are supposed to be promoting. Penang suffered from their Botanical Gardens arches but the people won and had them removed. In Ipoh we have these towers and an ugly arch in Little India now (not to mention the toilet). Why do government love to add these extras to everything when they are not needed? As you can see, the pedestrian walkway is so wide. I hope our new bridge( now under construction) also consider this as a need. However, the new bridge has been given a new look but not widen.